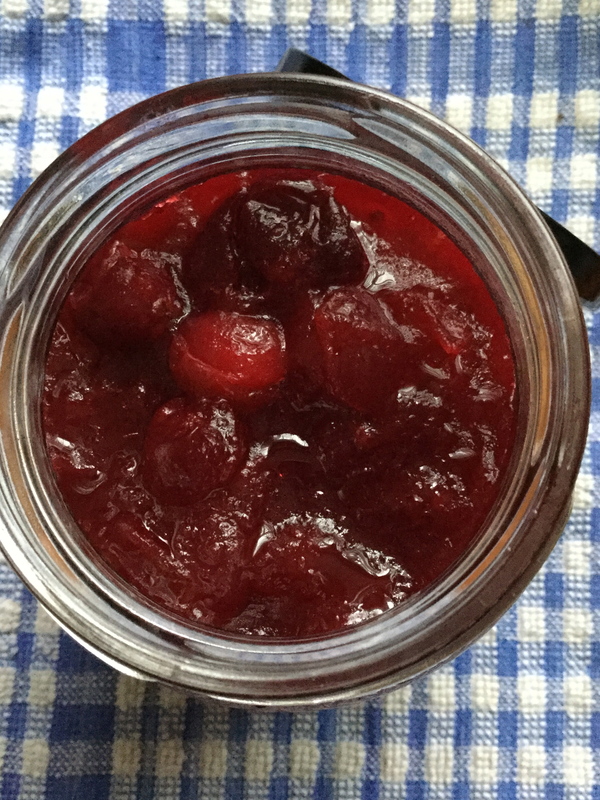 Dawn: Day Two of Love Food’s 12 Recipes of Christmas brings you a very traditional staple to be found on many Christmastime dinner tables: cranberry sauce. Deliciously tasty and oh-so-easy-to-make. Andrew: Oh, do tell more! Dawn: The clue is in the title. Pour the orange juice and sugar into a medium size saucepan, and place it on a medium heat. Stir the ingredients until the sugar dissolves and steam is rising from the liquid. Add the cranberries and stir into the orangey-sugary mixture. 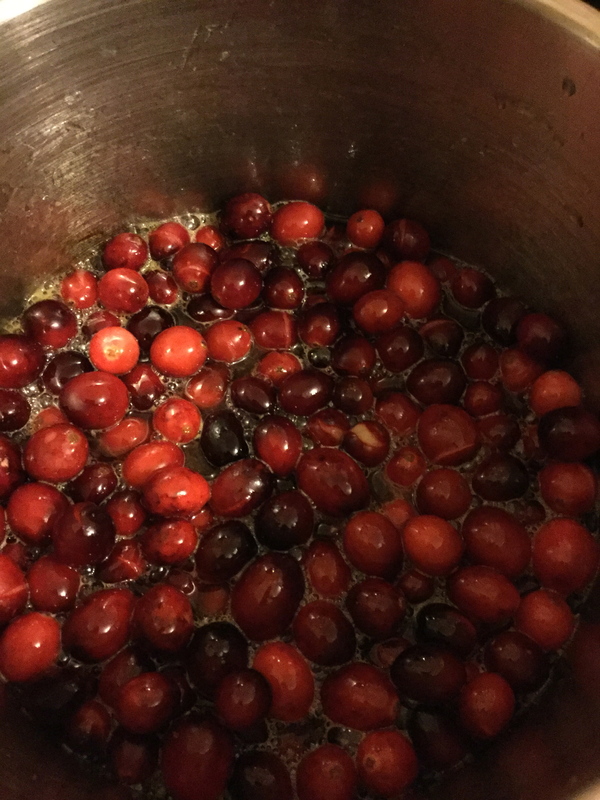 The cranberries will begin to make popping sounds and will gradually start to ferment. Keep stirring the ingredients for about 10 minutes. The sauce will not become thick like jam but with retain it’s luscious runny constituency with many of the fruits holding their whole plumpness. Set aside and when cool enough, pot in sterile jars and store. Dawn: These ingredients make two jars and with the second jar, I added one and a half tablespoons of pomegranate sauce. 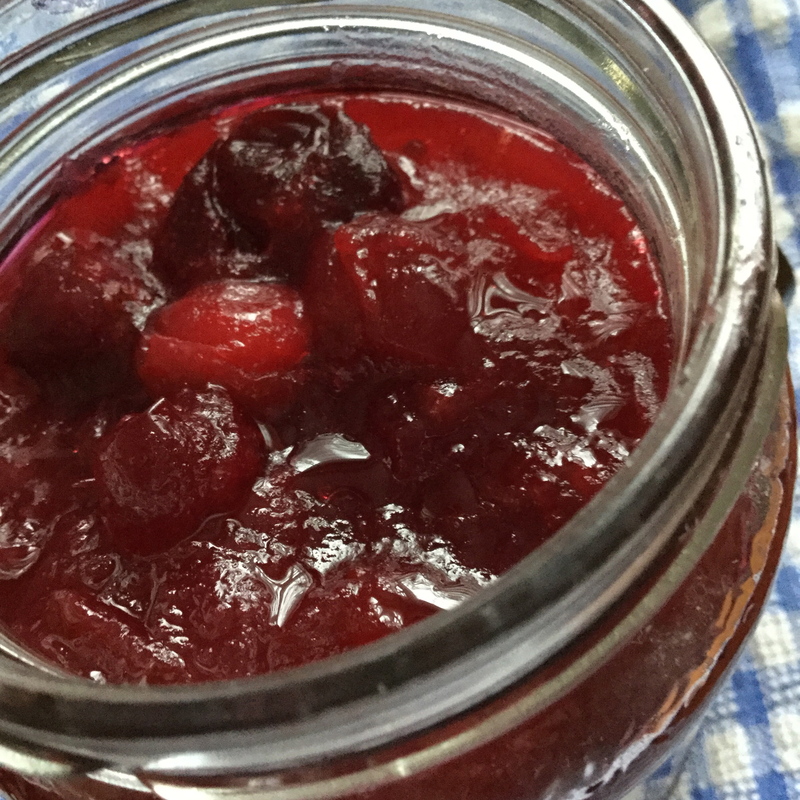 This adds an extra dimension of sticky sweetness to the poppingly-good-googiness of the cranberry sauce. Andrew: And tastes great on both warm and cold meats. 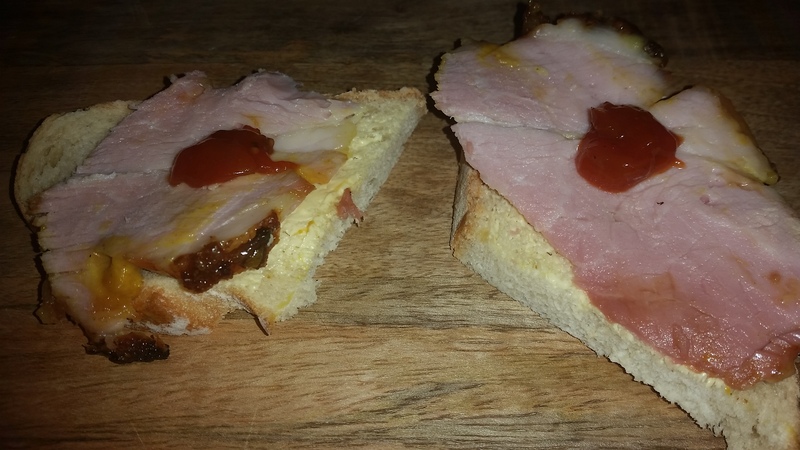 Andrew: A traditional ham, with a wee special twist. Dawn: Ham! Delicious and a wonderful nostalgic Christmas Eve smell wafting through the house. Andrew: Carols from Kings. The Snowman. Dawn: I’m famished! So how do we do this? 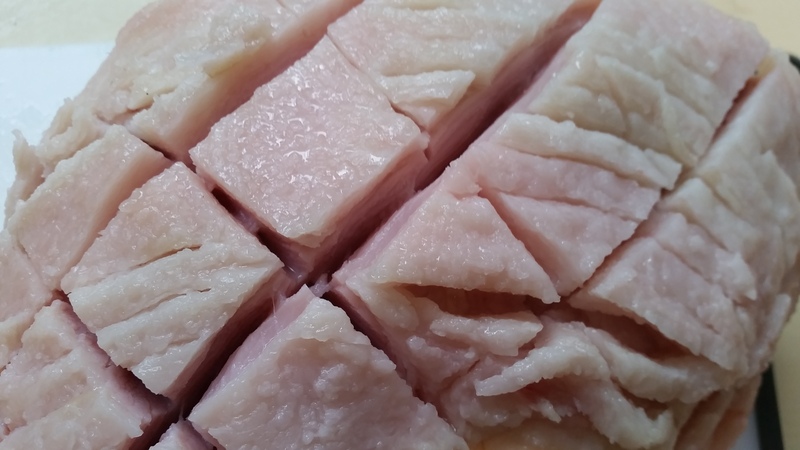 Your ham should be soaked for 12-24 hours to remove as much salt as possible, changing the water frequently. Pre-heat oven to Gas Mark 3/Electric 160⁰C. In a baking tray lay two pieces of tin foil crossing each other. Place the ham in the centre of the foil, season with black pepper and rub 1tsp of Five Spice into the surface of the meat. 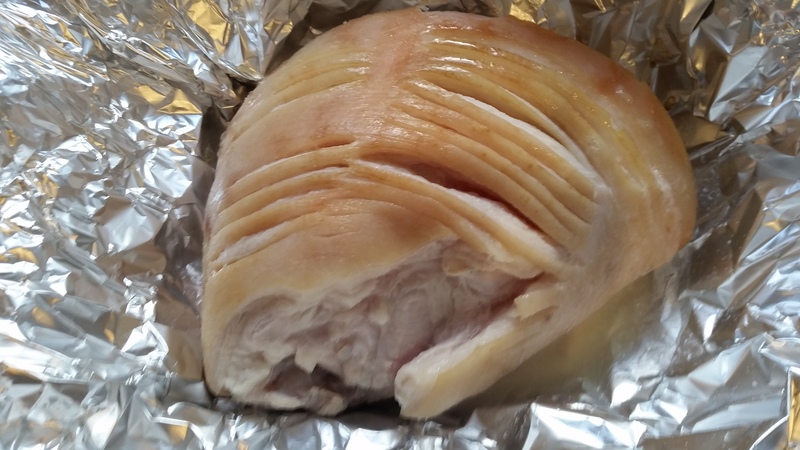 Fold the first piece of foil over the ham and crimp the edges together. Try to leave a space around the ham, like a small tent. This allows heat to circulate. Repeat with the second piece of foil. 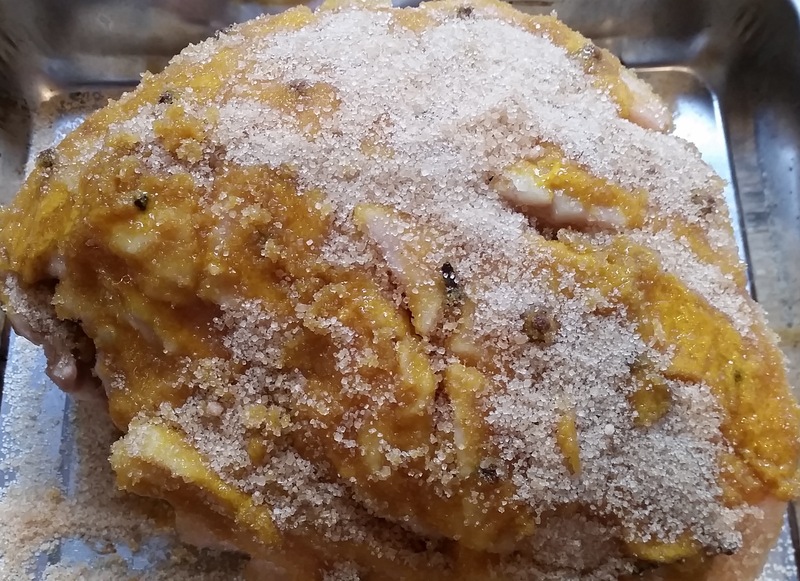 Place in the oven for 20 minutes per pound/half kilogram. 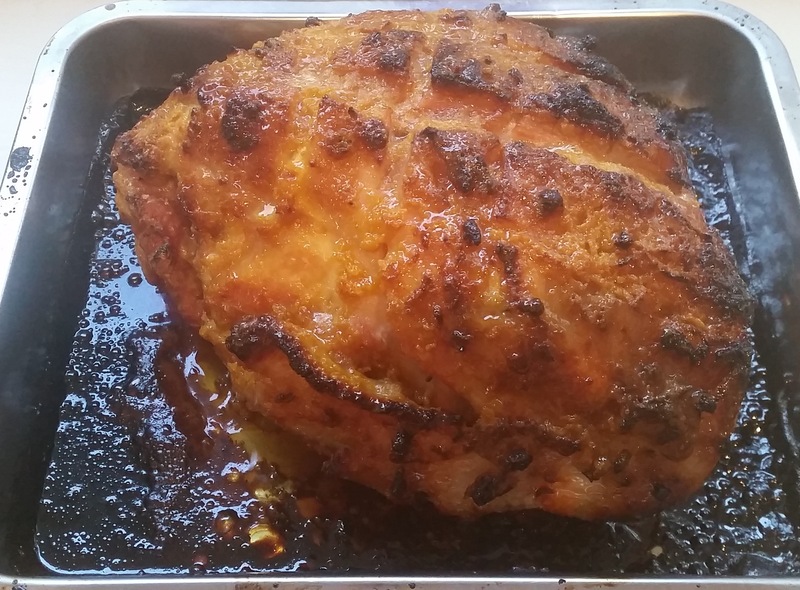 We used a six pound/three kilogram ham, so cooked it for two hours. After the cooking time is up, remove the baking tray from the oven and turn the temperature to Gas 7/200⁰C. Unfold the foil and carefully remove the ham to a chopping board or clean kitchen work surface. Use a sharp knife to cut away the skin, leaving as much fat as possible. Use the same knife to cut diagonals about 2 cm apart across the fat. Repeat in the opposite direction to produce a criss-cross effect. Press the sharp end of each clove into each of the sections on the fat. Mix together the remaining Five Spice and sugar in a bowl. 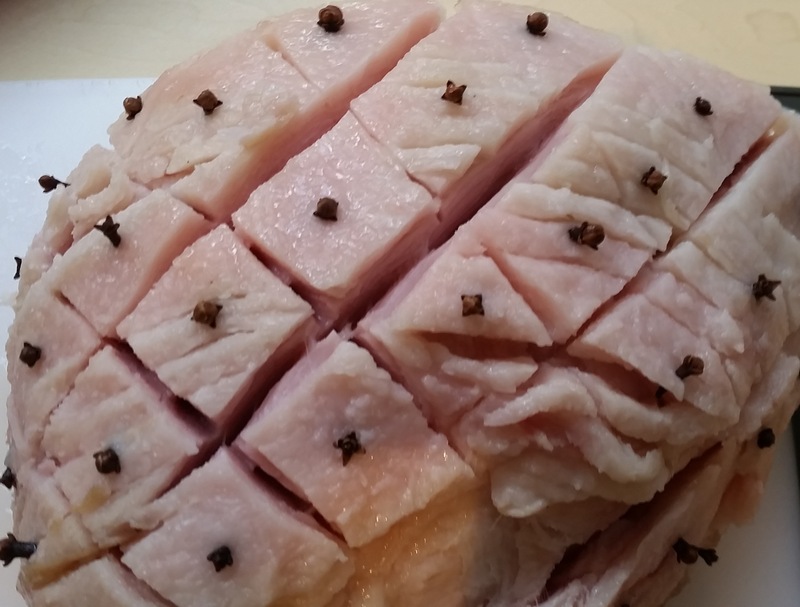 Using a flat knife, spread the mustard onto the surface of the ham. As quickly as you can, spread the sugar and spice onto the mustard with your hands. It will drip if you aren’t quick! Place ham back in the baking tray and return to the oven for about 30 minutes until you have a wonderful dark brown glaze. Andrew: I love a bit of it still warm. Dawn: Or with some pickles and a chunk of crusty wholemeal bread. Andrew: How about with cold turkey cuts for a Christmas Day supper? Dawn: Alternative glazes can be made with honey, or even with marmalade or cranberry sauce. Andrew: Five Spice was just the spice to hand. Cumin seed or allspice could have been used too. Any old spice, but not any of that Old Spice from the back of the bathroom cabinet!!! Hohoho! Dawn: Hilarious, I’m sure. Keep your eyes open for the next 11 days as we will the blogging more tasty and seasonally popular recipes with more festive Christmas foodie favours. Dawn and Andrew: Merry Christmas everyone! Dawn: If you only make real gravy once a year, this is your chance. It exploits all the flavours of the meal and although it is a labour of love, it is worth every minute of the effort. Andrew: It does need you to have turkey giblets from your butcher to follow each step. Dawn: If you have a frozen turkey, or you can’t obtain giblets, turkey stock, or a good chicken stock, are available as an alternative. Andrew: Lets start with the giblet stock. Wash the giblets, place in a saucepan with the onion, add water to cover and bring the pan to a simmer.